Triangulation chart of part of South Carolina's coast near Charleston. Sketch E No. 3 North and South Edisto River and St. Helena Sound South Carolina. 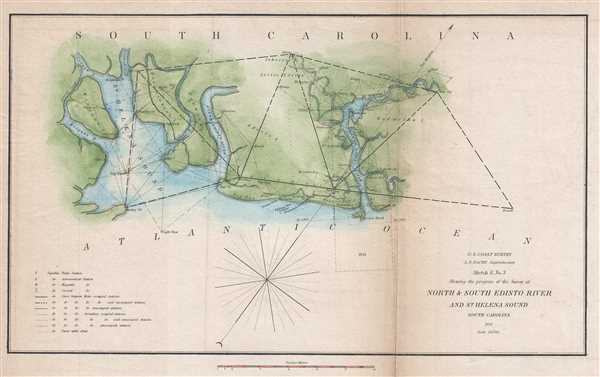 This is an attractive 1851 U.S. Coast Survey triangulation chart of the coast of South Carolina between St. Helena's Sound and the North Edisto River. The map depicts from St. Helena Sound to the North Edisto River and focuses on the inlets and waterways on Morgan’s Island, Hutchinson’s Island, Fenwick’s Island, Wadmelaw Island, and Edisto Island. Tidal, astronomical and magnetic stations are noted. Progress maps of this sort were made to illustrate work of the survey and accompanied the Superintendent of the Survey's annual report to Congress. This chart was compiled under the direction of A. D. Bache, Superintendent of the Survey of the Coast of the United States and one of the most influential American cartographers of the 19th century. It was printed in the 1851 edition of the Report of the Superintendent of the United States Coast Survey. Bache, A. D., Report of the Superintendent of the United States Coast Survey, (Washington) 1851. Very good. Backed on archival tissue for stability. Minor wear and toning along original fold lines.